In choosing the venue for its biggest event of the year, Frontit, which is recognised as one of Sweden’s best employers, eschewed Paris in favour of Pärnu. 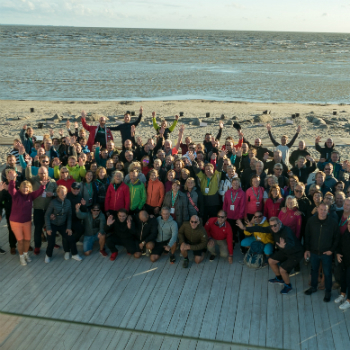 The company employs 191 people, the majority of whom descended on the ESTONIA Resort Hotel & Spa in mid-September to set new targets with their colleagues and shore up their team spirit. The event, they later assured the hotel, was a great success, not least because they got to enjoy a relaxing break in Estonia’s premier seaside resort. Preparations for the company event started six months ahead of arrival. Originally the trip’s organiser planned to take the Frontit team to Latvia, but when the logistics of the trip proved unfeasible all eyes turned to Estonia. The initial idea had been to catch the ferry to the Latvian capital Rīga and then to return to Sweden via Estonia, but since the Frontit team come from different parts of Sweden this would have meant an inordinate amount of time getting there and back for those living in Southern Sweden. A workable solution was reached when they decided to combine ferry and flight options. As such, the team crossed the Baltic Sea, making a start on their event on board the ferry before docking in Tallinn. They later returned to Sweden on various flights. ESTONIA Resort helped to organise Hansaliinid bus transfers from the port to the hotel and from the hotel to Tallinn Airport. In selecting the destination for the event, the organiser of the trip had the whole world to choose from. However, since they had been to Pärnu before and enjoyed it, they decided in favour of Estonia’s charming summer capital. Once this decision was made, representatives of Frontit were invited to ESTONIA Resort Hotel & Spa so they could see with their own eyes what it was the hotel was offering them and so that the hotel could work on the finer details with them in person. This visit took place in late May, when the early summer- like weather meant the city was already enjoying a resort atmosphere. The flexible team at ESTONIA Resort Hotel & Spa brought in a number of local partners so as to ensure that the Frontit team’s two days in Pärnu would give them plenty to do and even more to enjoy. In order to make the most of the city’s main attraction – its long, sandy beach – we called on the services of the Aloha surf club. They helped carry out a team event on the beach in the course of which the participants worked together to develop their creative visions of Frontit’s future. 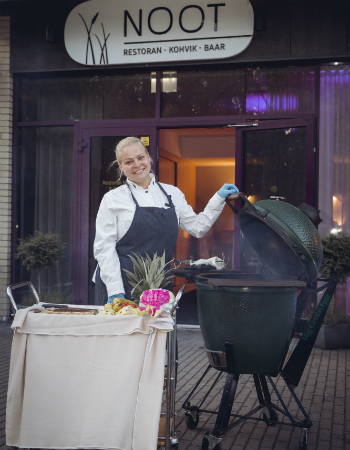 The client was also interested in a barbecue night on the beach, but due to the unpredictable September weather this took place on the restaurant’s terrace at the hotel. (The beach was being buffeted by strong winds that day, so relocating the event was the right decision.) A spa party had been arranged for the group following their dinner. 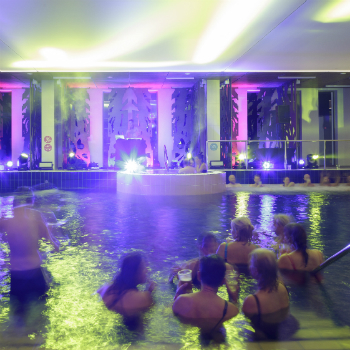 All the delights of the spa were made even more memorable by transforming the venue into an amazing nightclub. You would be amazed at what can be achieved with some lighting, special effects and music! Despite the programme bring so packed, the team managed to squeeze in some useful discussions and workshops in the conference centre on both days. 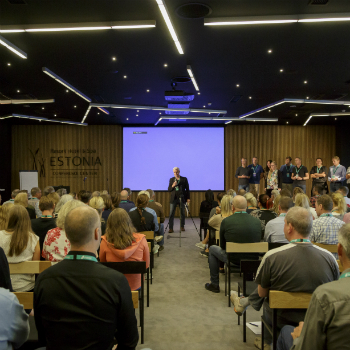 The large conference room and smaller seminar rooms at the ESTONIA Resort are perfect for events that start off as one large collective before breaking up into smaller working groups. The afternoon of Day 2 was set aside for individual activities, with the hotel’s spa attendants offering the participants their magical services from lunch time all the way through to the evening. These treatments proved the most popular activities, being snapped up during the registration period. The Frontit team were so impressed by the Spa Department that they in fact ordered further treatments. In addition, being a very sporty group on the whole, many of the participants enjoyed yoga classes and Les Mills training or kayaking and surfing with the Aloha surf club. There were also plenty who enjoyed the long ‘fat bike’ rides on the beach. The wide tyres on the modern version of this mountain bike even allow you to traverse sand dunes. of getting lost on the way back. The company event culminated in a gala dinner at the Eagle golf club restaurant. One of the challenges in organising such an occasion is taking people’s different tastes into account. With a breakfast bar or buffet it is de rigueur to provide dishes suitable for vegetarians or those who are gluten- or lactose-intolerant. But how do you arrange a silver-service dinner so that everyone is served the right things in the right amounts at the right time? From the point of view of the kitchen there are a lot of details here that demand you work closely with the client to agree on the best approach. Tables plans are often of help, but not always the client’s preferred solution. Frontit, in this case, favoured a party format, with the diners themselves choosing where to sit once at the venue. Thankfully, working with the client we came up with a very effective solution. Another area which requires you to consult with the client is the programme for such an evening, including the timings of the meal. This meant close cooperation between Frontit’s gala programme managers, the catering manager at the restaurant and their technical partner. When you organise such an event, the most satisfying moment comes when it is all over and there is a smile on the client’s face. Where large-scale events are concerned there is only one thing you can be certain about: nothing is for certain. Whether it is inclement weather, people falling ill or some other obstacle, the organisers and front-line staff always have to be prepared for last-minute changes and be capable of turning them into solutions that keep the client happy. What made the Frontit event so special was the fact that all of the services throughout the resort saw full use for two whole days and that our local partners also benefitted: the Hansaliinid bus company, the GoTakso taxi firm, the Aloha surf club, the Eagle restaurant, our technical partner TeTech and the photographers who captured the event. If you´d like to organise as memorable event for your clients or team, don´t hesitate for a second to contact us!